This time last year we began a collaborative project with eight students at Cape Elizabeth High School to test the water quality of Great Pond and Alewife Brook. We were so thankful for the grant we received from the Casco Bay Estuary Partnership, enabling us to purchase a multi-parameter meter that simultaneously captures water temperature, pH, dissolved oxygen, conductivity and dissolved solids data. We also were able to acquire a turbidity tube in order to test the water clarity. 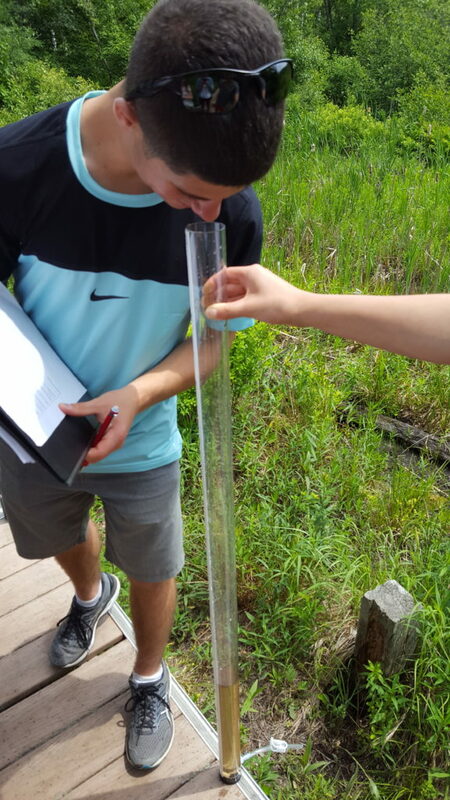 In May and September, the high school students headed out to Alewife Brook to learn how to use the equipment, collect data and discuss the importance of water quality of streams and other local water bodies in Cape Elizabeth. During a September outing, the students also investigated freshwater macroinvertebrates in the stream, finding caddisflies, freshwater snails, damsel fly larvae and fingernail clams to name a few. The students were enthusiastic about studying both the abiotic and biotic factors of the stream. Over the summer, CELT continued to collect water quality data on Alewife Brook and Great Pond with the help of volunteer, Deb Murphy. This long-term information will help in better understanding what is considered “normal” and healthy for these water bodies, and identify any changes in the future. We are excited to share the water quality data on our website early next year!